Living… in Los Angeles. Daniel lived in luxury for most of his life, until he suddenly passed away in a freak automobile accident. Visiting… the afterlife. After death, Daniel has found himself in-between Heaven and Earth, a place called Judgment City, where the recently deceased go to have their lives judged before entering Heaven...or being sent back to live another life on Earth. Profession… advertising executive. At least he was, until he died. 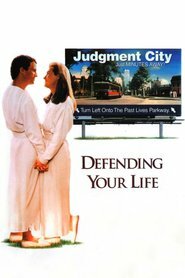 While in Judgment City, Daniel has to “defend his life” in front of two judges. Did his job make him a better person? Challenge… defending his life thoroughly and move on to Heaven. Though they don’t like to call it a “trial,” Daniel and his defense attorney have to make a case for Daniel to be let into Heaven, or else he’ll be forced to be reincarnated back onto earth. Personality… bumbling and frightened. Daniel finds that the judges in his life trial don’t take kindly to his inability to face his fears. Most of the misjudgments he made his life were “fear based,” something which he vows to improve upon. Daniel Miller's popularity ranking on CharacTour is #4428 out of 5,000+ characters. See our top-ranked characters and read their profiles.